Considering sustainable travel is an important part of many business and learning establishments. To consider how staff and students travel, not only to the site but also between distance separated buildings is vital. There are of course many solutions but it may be that some have been overlooked. An electric bike is probably one of those less obvious solutions to sustainable travel. However it could play a big part in finding a solution. An EAPC (Electrically Assisted Pedal Cycle) is a conventional bicycle with the addition of a motor. This is either in the hub (wheel) or crank (gearing), also a rechargeable battery and a control system. 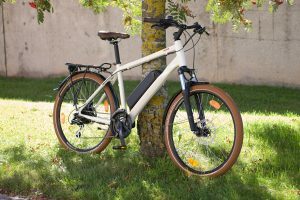 The Electric Bike is ridden in the same manner as a conventional bicycle. But the motor assists the rider making inclines and distances much easier to cover than on a conventional cycle. Of all trips made in Great Britain in 2009, 20% covered less than 1 mile. More than half (56%) of car journeys were less than 5 miles (Department of Transport 2010a). In Britain, the average time spent travelling on foot or by bicycle has decreased, from 12.9 minutes per day in 1995/97 to 11 minutes per day in 2007 (Department for Transport 2010b). 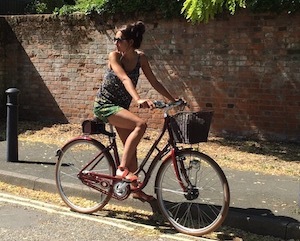 Cycle use in Britain is lower than in other European Union (EU) countries. 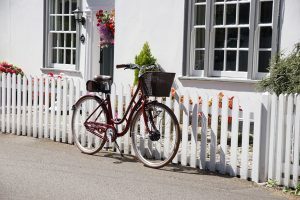 It is estimated that bicycles are used for 2% of journeys in Britain compared to about 26% of journeys in the Netherlands, 10% in Denmark and 5% in France (Ministry of Transport, Public Works and Water Management 2009). It’s well known that a car is most inefficient when cold and during such short journeys. The catalytic elements within the exhaust system do not operate fully and so not only are such journeys most damaging to our cars but also our planet. A decision to cycle or walk rather than drive reduces the emission of air pollutants, including carbon dioxide. Motorised transport, in terms of congestion, poor air quality, collisions and physical inactivity, costs English urban areas around £10 billion a year (Cabinet Office 2009). (The cost of each element is of a similar scale.) The cost of greenhouse gas emissions and the annoyance associated with noise are smaller, but are still significant. In the case of greenhouse gases, costs are expected to rise sharply in future years (Cabinet Office 2009). Traffic congestion costs UK businesses £22 billion a year (Source: CBI). Providing sustainable travel options for employees and customers makes good business sense. It can save time and improve the environment. Furthermore when you add the associated costs like staff expenses, car park charges and fleet management costs, it offers financial savings too. A travel plan can be a valuable part of the organisation’s ‘Corporate Social Responsibility Policy’ (CSR) or ‘Carbon Reduction Strategy’ (CRS). Universities and Further Education establishments face a number of significant challenges in terms of transport. With multiple sites, a large population of students and lots of staff to manage, transport is a key component to the smooth running of their operations. The addition of EPACs can also bring health benefits. Consequently they can offer reduced air pollution and reduced road traffic accidents. Additionally they can show increased physical fitness and reduced stress associated with driving and parking. It seems that many university travel plans are aimed at getting students to cycle and promoting storage etc. But they are lacking in considering the use of EAPC’s for staff to travel between campus sites or for less able students. Also there is a high promotion of showers indicating arriving in a state that required this facility. In conclusion, a pool of EAPC’s for use by staff or hire for students would reduce this need and also the time required to use these facilities. Contact BATRIBIKE today for demonstrations and further advice about integrating Electric Bicycles within your sustainable travel plans. FIXBIKE the cycle shop is the official Batribike stockist for electric bikes Weymouth. Nigel has a range of Batribikes available for test rides.